To purchase tickets contact the opera office. Pre-Reserves end September 23. ALO’s new production of La Traviata features a unique artisticduo. The highlights of which are scenic designer Julie K. Ross and metropolitan opera soprano Elizabeth Caballero. Ms. Ross has her hands in everything on stage. Product designer by day at I Play Baby Wear and scenic painter at night, Julie tirelessly spends every moment in her element. Julie’s work goes on display in October, but who will be performing on her canvas? Elizabeth Caballero joins the cast of La Traviatato bring her Metropolitan Opera talents to Julie’s stage. Ms. Caballero’s credits include playing the role of Frasquita in the Met Opera’s production of Carmen, and recently playing Madame Butterfly in The Lyric Opera of Kansas City’s production of Madame Butterfly. Two women of great talent, one local, one on the national scene, find their artistic counterpart in Asheville Lyric Opera’s La Traviata. 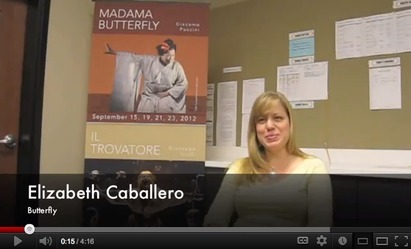 Watch this interview with Elizabeth Caballero from her time at The Lyric Opera of Kansas City. La Traviata comes to the Diana Wortham Theatre October 5 and 6. 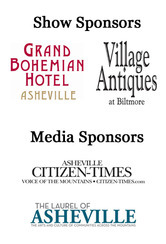 For ticket, call the box office at 828-257-4530 or go online. The Metropolitan Opera kicks off it's live in HD season with a new production of Donizetti's L'Elisir d'Amore. 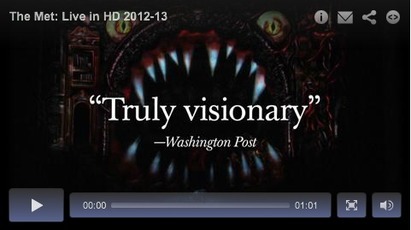 Join the ALO at theCarolina Cinema of Asheville on October 13.